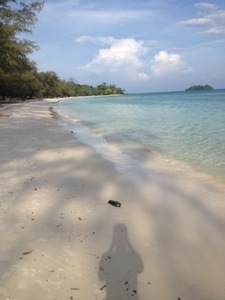 Another side to Cambodia – beautiful beaches and no pollution! 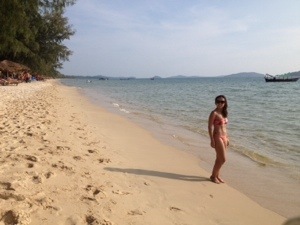 Leaving the chaos of Phonm Penh it was time for beach time. 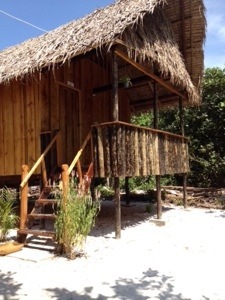 Just a 5 hour bus ride at $7 to Sihanoukville and the madness of Phonm Penh was replaced with a beach resort. It reminded me of any other seaside town; a beach, bars and shops. Once off the coach we were met with tuk tuk drivers and men on motorbikes. 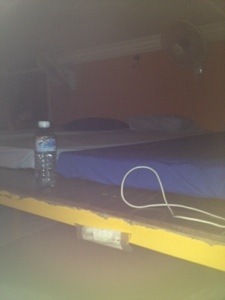 For $1 me & my backpack jumped on the back of a motorbike and headed for a hostel. The hostels here were mainly bungalows, which could be quite pricey as a single traveller but lucky for me I was with Jenni, a Spanish girl I had travelled there with and so we shared a bungalow at Big Easy Hostel for $4 each. After being in Thailand, prices in Cambodia seem rather expensive! We started our first day on Serendipity beach but this is where all the nightlife is and so the sea wasn’t very clean. We paid a man & his motorbike $2 to take us to Ortis beach; this was more like it! Clean white sand and clean blue sea. 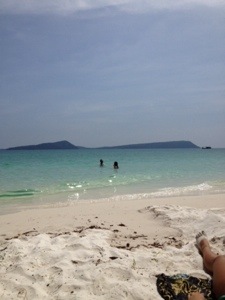 The next day a group of us headed for “the island” named Koh Rong. A 2 hour boat trip at a pricey $10 each way, I was met with pristine white beaches, turquoise water and limited development. Backpackers staying in Sihanoukville will undoubtedly head over to “the island” for a few days, but with only 18 clusters of bungalows, no roads and no electricity, only current generator generating electricity at certain hours of the day, it still has that desert island feel. I doubt developers will allow it to stay like this for long though! As there was 6 of us we were able to get a lovely beach bungalow at Happy Bungalows for $12 each, very pricey for a backpackers budget, but it was a treat to ourselves. Unfortunately I only stayed for 1 night and 2 days and by day we relaxed on the beach and swam in the warmest sea I have ever been in. By night the sky was so clear you could see hundreds of stars. We drank through the night and by 3am we were swimming in the sea (still as warm as a bath) amongst the lights of the plankton. What an amazing experience!